First off, congratulations on going through recovery! You did an amazing thing for yourself. Your lifestyle is going to be both happier and healthier. There is definitely going to be lots of balance in your life that you probably weren’t able to find while going through substance abuse. Before recovery, you were probably very lonely and anxious. You probably isolated yourself from your friends and maybe you even felt sick a lot. These things will occur way less often. Things won’t be perfect though. Your mental health has been taken for a spin. There are going to be adjustments to make in how you live and interact with yourself and others. Getting used to sober living can be extremely hard. Don’t stress though, just remember these relapse prevention tips. These will give you clarity and help you to find meaningful sobriety. As we said, life isn’t going to be perfect when you leave your treatment center. Although you may not consider yourself a drug addict anymore, you just recovered from being one. You need to accept that you cannot go through your first few months of sober living alone. You didn’t go through rehab alone, and you shouldn’t have to go through sober living alone either. Let your family and friends know how serious you are about recovery. Let them know that you won’t be participating in substance abuse anymore. Let them know of common triggers. If you don’t want them to have substances around you, that’s fine. Tell them. If you don’t want to talk about certain people or instances, let them know. Let them know of the warning signs . If you act a certain way when you’re really angry or upset, make sure they know that. That way, they know to keep you company and distract you. The people you love are willing to make changes for you if you need them to. That is what is so special about close friendships and family bonds. They will be readily available to help you make lifestyle changes. You want to move forward with your new way of sober living, so you have to make sure your loved ones know about your lifestyle changes. This open communication of your ways of relapse prevention will also help you in times of weakness. When you’re feeling tempted to use, avoiding relapse can be difficult. The best thing for you is to have a support system that knows about your recovery process well. This way, they can help you calm down and steer you away from using. Minimizing relapse is simply way easier when you have people around you that know what hurts you. Your family especially wants to see you happy and successful. You have to keep in mind that they have been affected by your addiction too. Having someone in your family go through drug rehab is hard. They never want to see you go through anything bad. They want you to live a long and satisfying life. That being said, they deserve to stay in the loop about your plans to reduce relapse. They deserve to know about how awesome you feel and about the times when you struggle. They can learn something from you and they can help you, but only if they know what’s going on. The best thing you can do for yourself is to listen to your heart and other trusted people on your path. Pay close attention to how you’re feeling and do your best to honor that. This will boost your self-confidence and make it easier for you to solve problems. This will also build better relationships with others, which is amazing during sober living. You’re a new version of yourself and you want to be the best one possible. When it comes to drug relapse, it usually will occur in high-risk situations. If you’re in a high-risk situation, listen to what your heart is telling you and remove yourself from that situation. If a loved one is trying to fight with you, remove yourself from that aggressive setting. Or, tell them they’re handling things the wrong way. If you’ve started a relationship that is stressing you out, take a break from giving someone else too much attention. If you don’t listen to your heart and remove yourself from something hurtful, you could end up hurting your partner. If your job is really hard, let your boss know that you just went through recovery. You could even ask them to ease your scheduling back slowly so that you’re not overworked. The bottom line is this: Don’t ignore your feelings. When you ignore your feelings, it’s hard to stay sober because those feelings bottle up inside. When feelings bottle up, relapse occurs. Substance abuse treatment is made for you to learn how to talk about things openly. It also points out the importance of accepting our feelings. When your mental health doesn’t feel so good, accept that. You know the warning signs of relapse. Since alcoholism mimics a behavioral disorder, it is probable you will be tempted to drink or get high. You have experienced substance abuse before. If you feel like you want to use drugs or alcohol again, let your coping skills replace what would have been drug abuse. The best thing you can do to ease your pain is to listen to your pain. The worst thing that can come from accepting your feelings is that you could feel a little uncomfortable. Not only have you expressed your feelings in rehab before, but what is worse, feeling uncomfortable or relapsing? Ask yourself this. What does your mind need that it isn’t getting? If you’re irritable, you need to do something that relaxes you. This could be physical exercise or a hot bath. If you’re stressed, do something that takes your mind off of that stress. Distract yourself. Turn off your phone and meditate. Or call a loved one and rant to them. If you’re feeling sad, it’s best for preventing relapse to be with someone. Go see a friend and watch a movie. They will cheer you up. If you just feel like ranting, you can always call your addiction counselor. There are so many healthy ways to listen to what your mind wants. Substance abuse is a temporary solution to your anxiety. In the long run, a relapse is only going to make you feel worse. Do not let your anxiety lead to relapse, because that relapse will cause more anxiety. Listen to what your heart is telling you. Use the coping skills you learned in your treatment center. Before Using Alcohol And Drugs, Write It Out! Often times when people leave alcohol and drug rehab, they find a new love for writing their feelings down. When you feel like you’ve had enough and you want to relapse, pause and write. Most of the time, relapses occur when people don’t stop to think about how they feel. They get uncomfortable with not feeling balanced and they just to the first thing they know will distract them from their pain. 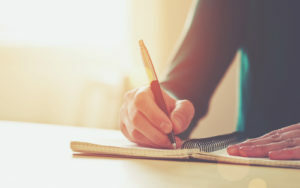 These addictive behaviors can be channeled for positive activities, like writing. Not only is writing awesome for your mental health, it also buys you time . This time will calm your mind down and make it easier for you to make the right decision. Addiction is a cognitive behavioral mental illness. When something upsets you, you use. When you’re not comfortable, you use.Your mind and body are stuck on that behavior being the best thing to do to calm you down. Rehab provides you with methods to express your feelings in better ways. So, a new cycle of behavior to get used to is to write. When you are sad, write down what’s making you feel low. Next, write a list of things you know can make you happy. If you are stressed, write down why. Get those feelings out on paper. You’ll realize how relieved you feel of negative feelings simply by writing them down. If you just feel like using because your body seems to be asking for drugs and alcohol, write down what staying sober means to you. What impact has going to rehab had on your life? It certainly improved your physical health. It improves your mental health and your relationship to your loved ones. It gave you coping skills that aren’t harmful to your life. You got to meet other substance abusers in rehab and make new friends. You are able to understand yourself and your emotions. When you take the time to really think and write about the transition you have gone through, it’s almost impossible to want to use. You would be moving backward and your treatment center has taught you to move forward from bad times. If you don’t feel like writing about drugs and alcohol, write a story. If you don’t feel like reliving your feelings but still want to avoid relapse, write for fun. You could write about your favorite memory with your loved ones. You could make up a story about something you’re interested in. Let your mind relax and take some time to breathe before you jump right into a recovery relapse. This is an essential habit in relapse prevention. Whether you’re an alcoholic or a drug addict, the research shows it’s all under the umbrella of addiction disease. Knowing your common triggers and signs of relapse will help you stay positive throughout early recovery. We know how painful the first few months can be, but if you are willing to try something different in your life, we are always available to help you, in any way we can. Cognitive behavioral therapy, meditation, 12 step recovery, and finding a support group will all contribute to addressing your addictive behaviors. Relapse prevention is simply knowing what to look for, and trusting your loved ones around you to tell you the truth. Freedom from alcoholism and drug addiction is not only possible, but a steadfast reality for us.